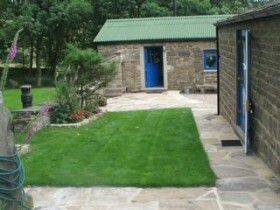 Situated under the edge of Haworth Moor, Whitestone Farm is a traditional 18th Century Pennine longhouse with outbuildings, converted over the past ten years to provide a variety of facilities and accommodation. The buildings are heated by a biomass pellet stove and log burners. The barn is a compact, insulated white studio with windows and black-out provision, lighting bars and a log-burning stove which runs radiators. It has a raised wooden (not sprung) floor 10 x 5.5 metres covered by a (removable) Harlequin Cascade dance floor, plus an alcove with seating and the stove. 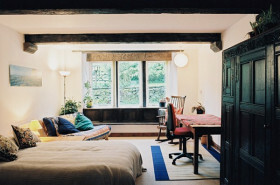 Height from floor to wooden beams is 4 metres. 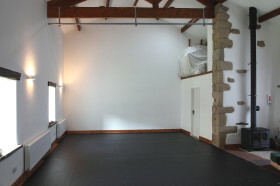 The gable end wall is suitable for projections up to 5 x 4 metres. There is a small photographic darkroom/storeroom with running water, accessible from within the building. 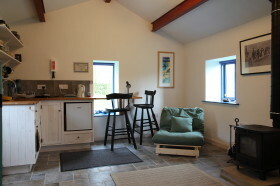 The stable room is a fully insulated former outbuilding with kitchenette, wood-burning stove and sofabed + futon. It is suitable for group discussions and individual study. There is a small workshop in the stable block, with long workbench. 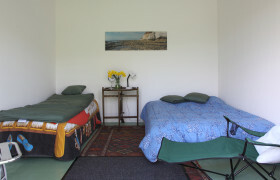 The 3⁄4 acre of garden has mature trees, a pond and some flat areas for tents (two can be supplied). We are entirely off-road up a track with plenty of parking space. Through our back gates are endless miles of the South Pennine moors, and Haworth is accessible via footpaths, including the Pennine Way, in an hour.